Cheraman Juma Masjid which is India’s first Masjid was constructed in the year 628. Renovations have been made to the mosque several times with the last one in 1974. It is located in Kodungallur in Thrissur district. It is also the second oldest Juma Masjid in the world where the Friday prayers are conducted for the past 1375 years. There is an old lamp in this mosque which burns at all the time. The devotees can offer oil to light the lamp. The architecture of this mosque is in the traditional Hindu style. Some stories are connected with the building of this mosque. According to legend, Cheraman Perumal who ruled Kodungallur had a vision of splitting of the moon. It was considered as the miracle of Holy Prophet at Makkah and this symbol indicates the arrival of the Messenger of God from Arabia. His nephew was asked to meet the Prophet and so he went to Arabia and met Prophet Mohammed at Jeddah. He was influenced by Islam religion and took the name Thajuddin. He also married the sister of the King of Jeddah. On his way back to India he died and before his death he gave some letters to his friends which were addressed to the Kerala rulers. When he died, Malik Bin Dinar and his friends reached Kerala and handed over the letters to his relatives. The letter said that the one who brings the letter should be treated well. They were then permitted to build mosques at various places in Kerala. 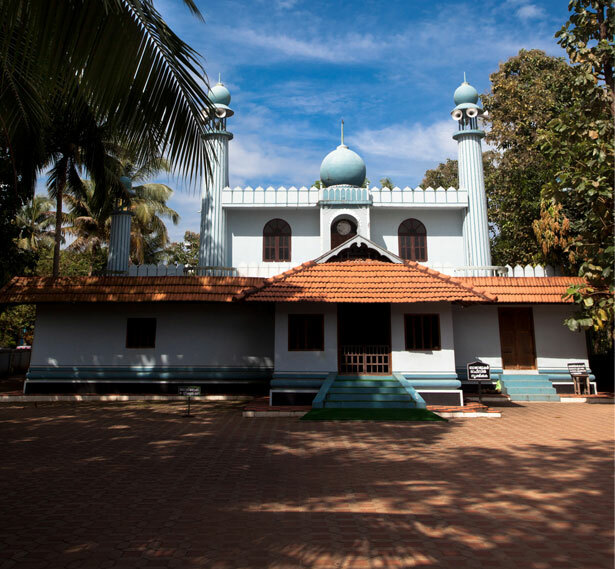 The mosque at Kodungallur was the first one to be established and Malik Bin Dinar became the Ghazi of this Masjid. Later his relative Habib Bin Malik was made the Ghazi. The tombs that are now at Cheraman Masjid are believed to be of Habib Bin Malik and his wife. People from different caste and religion are allowed to come to this mosque. It is the non Muslim people who conduct the Iftar during the Ramzan season. There are some non Muslims who conduct ‘Vidhyarambham’ which is a Hindu ritual for their children from this mosque. This mosque is at present run by a committee.